Even though I've been trying to cook more recipes lately, I still find it difficult to stick to someone else's plan. Last night we made spinach meatballs, which began as a recipe from Claudia Roden's unbelievably beautiful book of Jewish cooking. The recipe calls for beef or veal, and we opted for turkey. It calls for two eggs, and we used one. The only seasonings it calls for are nutmeg, salt, and pepper, and we threw in half an onion, for good measure. So I guess we didn't really follow the recipe....but the meatballs were delicious! The recipe I'm sharing today came about similarly. A New York Times food section recipe caught my eye, and I took the idea and ran with it. The recipe was for beet curry soup, and I noticed it the morning after having purchased three lovely, golden beets. Perfect. It turns out that my recipe is not much different than the Times recipe - beets, apple, onion, spice. I didn't use any butter (no need to, in my opinion), and I only used one apple, since I didn't want the soup to be too sweet. I also roasted the apple and onion in the oven instead of sauteing them. This worked out perfectly for me, because I didn't actually make the soup until the day after I had roasted the vegetables. Once you roast, you can pop everything in the refrigerator and puree the finished product whenever it is most convenient. 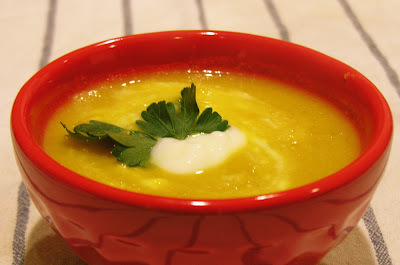 Although the recipe is straightforward, the soup is perfect - thick and warmly flavored, but a change of pace from ubiquitous butternut squash concoctions. Even if you don't love the taste of roasted beets on their own, I'm willing to bet you'll love the combination of flavors in this soup, especially with that cumin-curry kick. Plus, it's the perfect way to use golden beets, which I have recently determined to be the Most Beautiful Vegetable Ever. They may be humble from the outside, but once you cut into one (after roasting, of course), you'll see what I mean. Just a quick tip for roasting beets: be patient - the beets I roasted today took the better part of 90 minutes. Cut off any long roots or tops before roasting. Roast beets: wash and prick all over with a sharp knife. Drizzle with 1 tbs. olive oil and wrap together tightly in foil. Roast at 400 degrees for a little over an hour, until tender enough to be easily pierced with a fork. Once cooled slightly, peel and chop roughly. During the last 25 minutes of roasting, roast apple and onion until tender: coat with remaining olive oil and salt, pepper, and curry to taste, then pop into the oven. To make soup, cover vegetables with stock and heat until just simmering. Remove from heat and blend mixture in batches until smooth. Return to pot and season with additional salt, pepper, curry, and spices. Thin with additional stock or water if necessary. Serve with a dollop of plain yogurt and crusty bread.